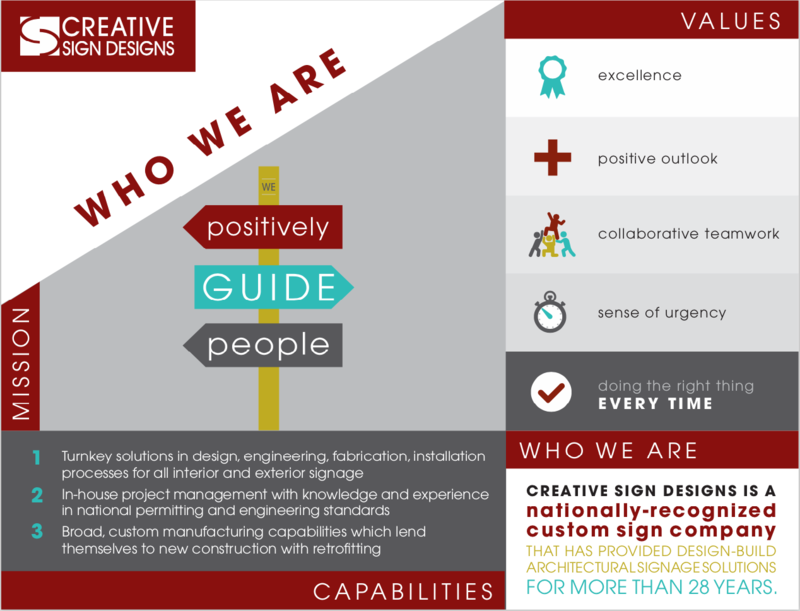 Founded in 1986, Creative Sign Designs, is a nationally recognized leader in custom interior and exterior signage. Our corporate headquarters is based from a 50,000-square -foot, integrated manufacturing facility in Tampa, Florida. We have the capacity and capability to execute large projects on a fast-track basis. Our systems and quality control management ensure that work is produced on-schedule and at the highest quality levels. Creative Sign Designs is committed to delivering unique sign products, superior workmanship and excellent customer service. We believe a successful signage program involves more than just investing in first-rate products. It requires meticulous planning and execution for it to be functional, cost efficient and compliant with pertinent regulations, such as the Americans with Disabilities Act (ADA). •We have a Commitment to Excellence in everything we do. •We have a Positive Outlook each day. •With Collaborative Teamwork we build a vision and a great company- together. •There is a Sense of Urgency to present precise, quality and thorough results. •Do the right thing, every time, by considering the impacts on our associates, customers and stakeholders.